Tottenham chairman Daniel Levy: "There isn't an hour that goes by when I am not asked when we will be able to stage our first game at our new home. I wish I was able to confirm an exact opening date and fixture." Tottenham’s new stadium will not be ready this year, the club have confirmed. Tottenham will continue to play at Wembley Stadium up to and including their game against Wolves on December 29. Spurs were originally due to start playing in the new Tottenham Hotspur Stadium from September 15 only for failures to "critical safety systems" to see the move date delayed. Manager Maurico Pochettino said last month it was "his wish" for the club to be playing in their new 62,000-seater facility this year, adding he was confident that would be the case. But in a statement released on Friday evening, chairman Daniel Levy confirmed that this will not happen and apologised to Spurs fans looking forward to moving into their new home. "There isn't an hour that goes by when I am not asked when we will be able to stage our first game at our new home," Levy said. "I wish I was able to confirm an exact opening date and fixture. However, in light of factors completely outside of our control, contractors missing deadlines and possible future unforeseen issues, we are naturally being cautious in respect of our timetable for our test events and official opening game. "Whilst we are conscious of the need to keep pressure on our contractors to deliver as soon as possible, we are also acutely aware of how difficult the lack of clarity is for you, our supporters, to plan around games, particularly those at Christmas and New Year. 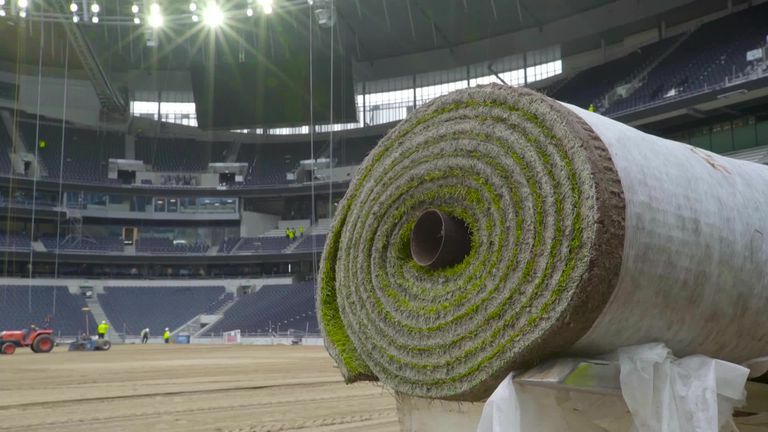 Tottenham began laying the turf at their new stadium at the beginning of October, raising hopes they could be playing there before the end of 2018. "In light of the above, and taking into account the restricted availability of manpower over the festive period, we have taken the decision to confirm today that all home games will be played at Wembley Stadium up to and including the game against Wolverhampton Wanderers on 29 December. "We know the continued delay is a source of immense disappointment to everyone and I can only continue to apologise for this - it is a sentiment felt by all of us." Levy said Tottenham are using the delay as an opportunity to bring forward future works, particularly around track and station improvements. He added: "We have no doubt when open that this stadium will be one of the finest in the world - a leading example of British research and development delivering engineering and technological firsts that will be showcased globally. "I hope that the end result will be something that will make you proud. We shall look to update you again in early December."